To all those starting back to school today, have a wonderful first day back. Cheers to another fabulous school year! Neither of my kids wanted me to walk them to class like I have done for them each year. I was so sad but happy that they are growing up to be independent. She is a 5th grader and He is a 2nd grader. They grow so very very fast. Moving on - over the weekend we had a bridal shower for my one of my cousins. I simply love weddings! The planning, crafting decorations and seeing the happy bride and groom. I cut the gown at 4" from the Cricut Cartridge Bridal Shower to create a bridal shower card. The sentiment 'Love' and the message on the inside are both from My Creative Time. Thank you for stopping by. Hope you have wonderful day! Happy Back-to-school for those already back! We start back on Monday and I have to say that I am ready and so are the kids. Summer has been a blast but I am ready for our school routine. Tonight is back-to-school night to meet/greet Teachers. I DO know that my son has the same teacher from last year (which I am excited about - and so is he), Ms. Smith. But I digress, I made a house warming card for my sister and brother-in-law. They recently purchased a home and to celebrate they had a pool party. So much fun. My daughter is the one who inked the tree - she did a wonderful job. The house is from Cricut Cartridge Pop-Up Neighborhood page 35 cut at 5". The fence is from Cricut Cartridge Heritage and the grass is cut from Cricut Cartridge Country Life. The butterflies and flowers are small EK Success punches. The sentiment is My Creative Time. So sorry for the late post. 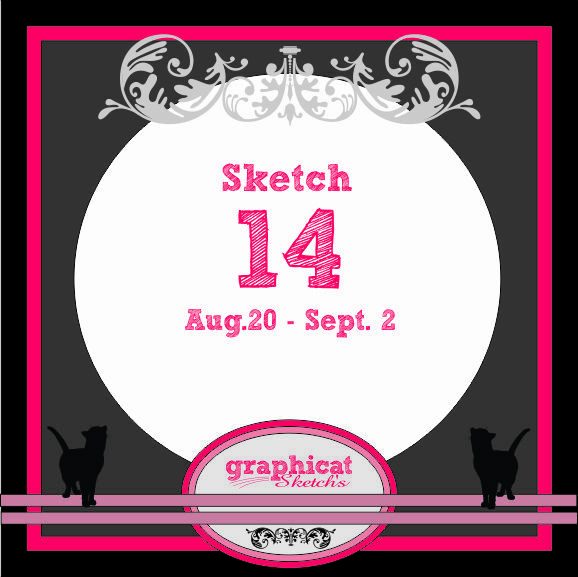 Yesterday brought another fantastic sketch challenge over at Graphicat Sketches, sketch 14. My take includes a sentiment from Graphicat Stamps and an image from Simply B Stamps. 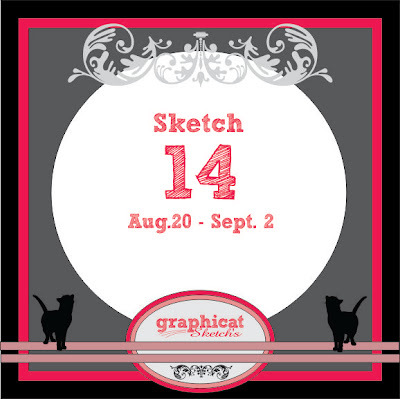 The winner of this challenge will receive a $10 gift to the Graphicat Stamps online store. Hope you are able to join this week! I bet after you read the title of this post you were thinking, "Oops, but she is a day behind?" Actually I am talking about one of my niece's. (BTW-if you haven't figured it out already, I have a few nieces and nephews - 5 of each. 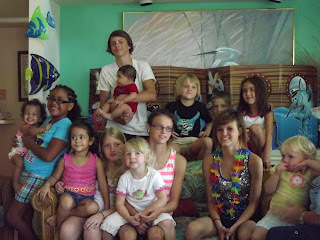 LOL) When you include my daughter and son, my parents have an even dozen grand-babies; 6 girls and 6 boys. Sorry for rambling...the card I am sharing today, is one I made for her. Her birthday is later this week. Using Saturated Canary image colored with copics, I combined it with My Mind's Eye 6x6 Nostalgia paper pad; Maya Road mini banner canvas, prima numbers, and ribbon from Dear Lizzy. For embellishment I used My Creative Time Tiny Tags and flower petal die. I am also linking this card to Saturated Canary's Challenge 23. As you know, we recently spent some time at the beach. So be prepared to see a few or a lot of beachy themed layouts. Supplies: Scraps of Darkness Escape & Envy kit; Graphic 45 Tropical Travelogue Alpha Stickers; Prima flowers & star burst crystals; My Creative Time's All Around Everything Accessories; Glue Dots; glossy accents; Kaiser rhinestones; Dear Lizzy's date stamp. He had so much fun on that board. By the time we left the beach, he was actually getting pretty good on it. And brave, so brave he went out far. I was close to a panic attack on the lookout for scary things in the water. LOL My hubby just laughs, grabbed the boy and off in the deep blue sea they went. Please make sure you check the previous post HERE, to see the winners of "Grey Goes West" Blog Hop. Purchase Saturated Canary images and donate to St. Jude's at the same time...that's a WIN-WIN for everyone! From the moment I found Saturated Canary images almost a year ago I feel in love with the images. Soon I started to follow to Krista's blog and really like the person she is: fun, inspiring, creative, devoted to her family and exceptionally generous. 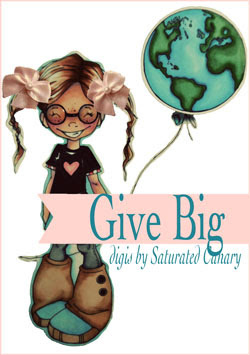 Krista, creator of Saturated Canary is donating all proceeds from two images specifically created for St. Jude's Children's Research Hospital. Visit her today or anytime this month. Hope you all had a great weekend and a fabulous Monday. The winner of the ribbon giveaway is..
Love love love love these!!! LOVING the grey tie!!!! I just finished reading that series!!!!!! Congratulations Julie, please email your mailing information and I will get your ribbon out soon. Please email Cheri your choice of digi from the new release found HERE. WOW, has it been that long since my last post...? It has been a whirl-wind these last two weeks. With the end of fiscal year approaching, work is starting to pick up and I have been working late. Students are starting to return for practice and registration and soon, August 27, school is back in session for both me and my kids. We went back to the beach last Friday morning for my Mother-in-Laws 60th Birthday party. My hubby's entire family (3 aunts, 2 uncles, 5 cousins and 10 kids) plus us rented a house for the weekend. It had been a while since we last saw them so it soon turned into a mini family reunion (not all family present). Although a bit crowded in the 4 bedroom/3 bath house, we all had a fabulous time! Mother-in-Law and birthday girl! Happy 60th Birthday! My precious Daughter - Aloha! My wonderful son, holding the newest member of our family. LOL, we have a boy shortage in our family (see kid photo above) the oldest boy is 16, my son 7 and now baby 4 months. He was so excited to see baby B, my son is so in love with him and wanted to bring him home with us. Treasure from the beach - 12 sand dollars, starfish and shell. View of the beach and a few of the kids playing and guys fishing. I will have a project for you tomorrow, so be sure to stop back by. There is still time to enter the giveaway, visit HERE. Also, a few weeks ago - Archiver's opened a store only 20 minutes away. When I told my hubby, he just shook his head and mumbled, "This is bad, it's going to get ugly." I just laughed and stated, "You have no idea...!"